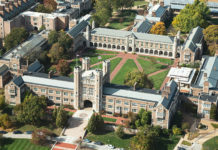 New fund means Wash U students are eligible to get $1000 grants to kick off their own start up. 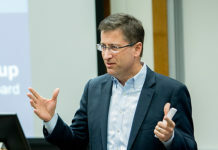 Cliff Holekamp, Co-founder and General Partner of venture fund Cultivation Capital and Professor of Practice in Entrepreneurship at Washington University, has given a $500,000 gift to Washington University to support entrepreneurship. The endowment will be given annually to students in twenty $1,000 grants. Holekamp believes these investments will help spur entrepreneurship by encouraging action and rewarding risk. As the St. Louis startup ecosystem is maturing, Holekamp sees a shift from very early to later stage funding of startups. “As a community, we have shifted to later stage investment, and that’s a product of our successes. Prior efforts have resulted in more activity, our funds are more successful at raising capital, and they’re writing bigger checks. 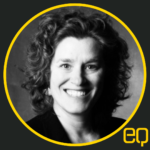 But we don’t want to forget about generating new startups into that pipeline,” Holekamp says. Arch Grants is a St. Louis non-profit with a similar mission. It provides $50,000 equity-free cash grants to a handful of successful business owners annually. These grants serve to lure innovative entrepreneurs to St. Louis in the interests of building a new, local economy. Fashion entrepreneur and brand Allison Mitchell received one of these grants and has relocated to St. Louis to avoid the premium of living in New York City. Agrela Ecosystems, An AgTech company and another Arch Grants recipient, has benefited greatly from a strong plant science ecosystem in St. Louis. Holekamp believes smaller investments in companies created by students who are already in St. Louis is all about timing. “To keep the St. Louis entrepreneurial pipeline strong and growing, we need to nurture companies at every stage of the pipeline. By being the first dollar in, it’s a lot more impactful than if it were invested a couple years later,” Holekamp says. The fund is intentionally designed to be different than a traditional university business plan competitions. In those, financial support ends up going to the person or team who is best at delivering a PowerPoint presentation. That, Holekamp contends, is no guarantee that the business will succeed. The Holekamp Seed Fund is designed to spread the impact as far as possible. “We thought, what if we take our budget and disperse it to dozens of startups and focus on giving a large amount of student ventures a smaller amount of money? That will make us part of the genesis story of dozens of companies, not just one. We will be encouraging the entrepreneurial ambitions of all our students, not just one lucky winner.” Holekamp says. As part of the regional strategy for innovation and entrepreneurship, the Holekamp Seed Fund promotes inclusivity and spreading the wealth. Washington University students can, do and will continue to compete at other universities for possibly larger prizes, but this gift shifts the paradigm. 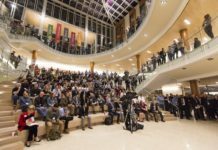 “Rather than trying to win the university contest for the largest prize money in a business plan competition, I’d rather win the contest for the university that’s the most prolific in launching startups,” Holekamp says. 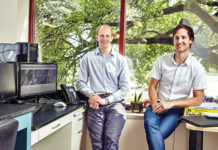 Holekamp can rattle off a long list of startups that began at Washington University and are now successful. Balto Software, ePharmix, Varsity Tutors and Answers.com, to name just a few. He also regrets the ones that were created by alumni but didn’t stay in St. Louis. Schoology started at WashU, but moved to New York and raised tens of millions of dollars of capital and now employs hundreds of people there. “Although I’m thrilled about their success, it’s a shame that isn’t benefiting the St. Louis economy,” Holekamp says. Following a “Pay it Forward” model, the Holekamp Seed Fund grants will be distributed with the request that when students are successful, they will return the grant over time as part of a charitable gift back to the university. “It’s important strategically for the school’s reputation that our graduates from entrepreneurial programs feel connected to the university and that they got that support from us. That they know where that first dollar came from. If they remember that when they are successful entrepreneurs, they’re going to be more engaged with the school and more likely to be engaged with the St. Louis Community,” Holekamp says.